Can I get trained by or at LEGO? No. In 2010 The LEGO Group made the LEGO® SERIOUS PLAY® method Open Source. The LEGO Group does not offer any kind of training. Are there any trainers officially approved by the LEGO Group? No. You can only get trained by organisations that are not part of, owned or approved by LEGO. It is worth noting that LEGO recommended that people wanting to use the method undertake facilitation training in the Open Source Guide they wrote (pages 30, 38 and 40). What is the 'Open Source Guide' and where can I get a copy? The Open Source Guide is a 48 page PDF written by LEGO in 2010. It describes the basic principles of LEGO® Serious Play® and has been made available by the LEGO Group under a ‘Attribution Share Alike’ Creative Commons licence. You can view and download a copy here. The LEGO Group own the LEGO® SERIOUS PLAY® intellectual property (IP), but in 2010 they made the method 'Open Source' and licensed the IP under a creative commons 'Attribution Share Alike’ licence. This means anyone is free to use, share and adapt the method, provided appropriate credit is given. We have built our training programmes using, adapting and developing the basic ideas. LEGO® SERIOUS PLAY® is also subject to a set of Trademark Guidelines. Facilitators who use LEGO® SERIOUS PLAY® MUST abide by to these clear rules. What are the pros and cons of the different training providers? There is a small and eclectic mix of organisations offering very different models of LEGO® SERIOUS PLAY® training. 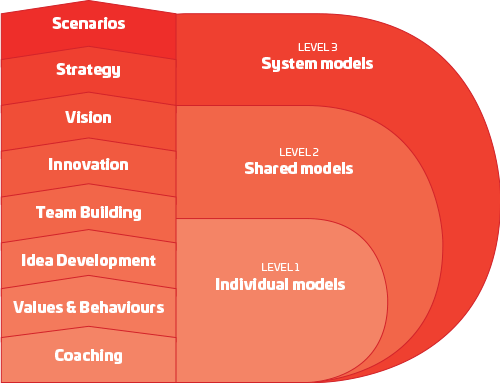 The original model (sometimes refereed to as '2.0') is a 4 day 'didactic' taught experience that gives participants an thorough experience of being facilitated with a strict adherence to a set of fixed ideas. Our training takes a different approach. It is based on experiential learning. We focus on facilitation of the method and combine other excellent facilitation tools and techniques that help lead groups to successful outcomes. You could think of the SERIOUSWORK training as being the 3.0 version of teaching and learning of facilitating the LEGO® SERIOUS PLAY® method. Read in participants own words how they experience our training. We have direct experience of the well known trainers, if you'd like to discuss the pros and cons of each, please get in contact. Who owns the Core LEGO® SERIOUS PLAY® Process? The core LEGO® SERIOUS PLAY® process described in the LEGO Open Source Guide is owned by the LEGO Group, subject to the creative commons licence. Anyone can use, share and adapt, the core process provided they give due credit to the LEGO group. We think LEGO® SERIOUS PLAY® meetings and workshops are most effective by following a six step process. Or you might think of it as a two + four process. Two vital steps in the preparation phase, and then during a workshop (often many cycles of) a four step process with participants. Certificate - noun: "A document confirming that someone has reached a certain level of achievement in a course of study or training. A university accredited certificate." All current LEGO® SERIOUS PLAY® certification processes, no matter which training provider, offer 'certificates of completion'. Provided you complete the training course you get a certificate of completion, this kind of certification does not mean people who are 'certified' have met quality assured standards of practice. However with SERIOUSWORK courses, trainees practice their facilitation skills and get feedback from peers. We'd argue that SERIOUSWORK certification is the gold standard. SERIOUSWORK Certified Facilitators have actually facilitated workshops using LEGO® SERIOUS PLAY® during training. Will I be a certified LEGO® SERIOUS PLAY® facilitator after training? Yes. Provided you complete the training and practice facilitating individual model building and shared model building you'll receive a certification. After training you can use the following designation and logo on your website, business card, email footer etc. How do I become a Certified™ Professional Facilitator? The International Association of Facilitators have a peer reviewed certification: the 'Certified™ Professional Facilitator'. We can mentor you through the process of becoming an IAF Certified™ Professional Facilitator. SERIOUSWORK are also developing with IAF a competency based certification process specifically for LEGO® SERIOUS PLAY® that trained facilitators who have completed any training programme with any trainer can proceed to. We aim to drive the quality of practice up though peer reviewed competency assessment processes. What are LEGO® SERIOUS PLAY® 'Applications'? 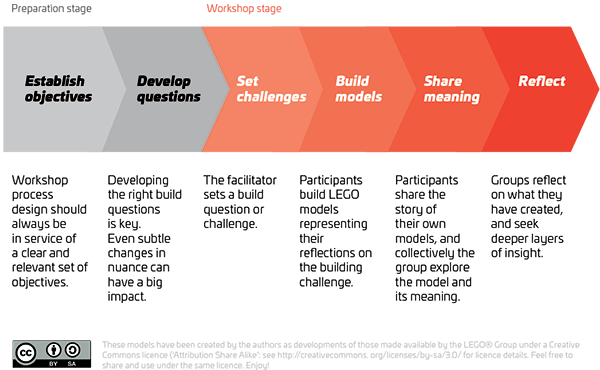 LEGO describe ‘applications’ as detailed roadmaps of different workshops which make use of the LEGO® SERIOUS PLAY® principles and philosophy used with LEGO® bricks. What does the 2 day LEGO® SERIOUS PLAY® masterclass cost? £1600 + VAT at 20%. Full details are on the bookings page. If you have a question not covered here, email Caroline@Serious.Global or give us a call.